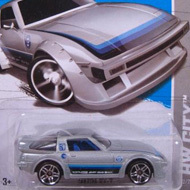 124/250 is part of the HW Racing series and the 2013 Treasure Hunt set. 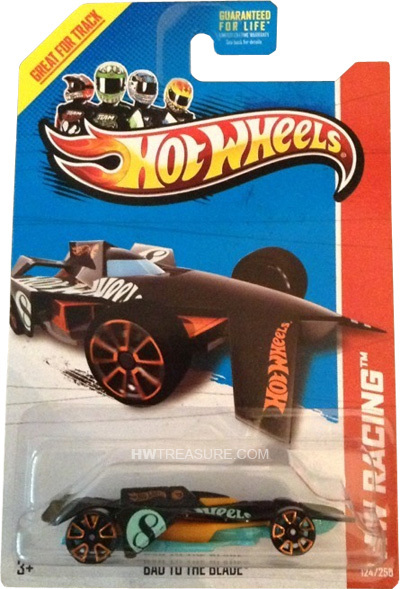 The orange & black race car sports white and orange Hot Wheels logos, the low production symbol, and an “8” in a teal circle. It has orange windows, copper Trapezoid 5-spoke wheels, and a teal base. The Blade is a unique design of a futuristic open-wheel race car. 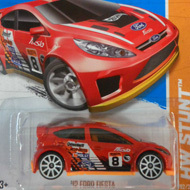 It first appeared in the Team Hot Wheels High Speed Wheel series in 2012.